The authors undertook an updated systematic review of the relationship between body mass index and dental caries in children and adolescents. The authors searched Medline, ISI, Cochrane, Scopus, Global Health and CINAHL databases and conducted lateral searches from reference lists for papers published from 2004 to 2011, inclusive. All empirical papers that tested associations between body mass index and dental caries in child and adolescent populations (aged 0 to 18 years) were included. Dental caries is associated with both high and low body mass index. A non-linear association between body mass index and dental caries may account for inconsistent findings in previous research. We recommend future research investigate the nature of the association between body mass index and dental caries in samples that include a full range of body mass index scores, and explore how factors such as socioeconomic status mediate the association between body mass index and dental caries. Obesity and dental caries are both multifactorial diseases that impact children’s health and psychosocial development[1, 2]. Both conditions contribute substantially to health expenditure; for example, the estimated total annual cost of obesity to Australian society in 2008 was $58.2 billion, and recent estimates suggest that being overweight or obese is the third highest contributor to disability-adjusted life years (DALYs; 7.5%). Dental disease ranks as the second most expensive disease in Australia (second to cardiovascular disease) and absorbs 6.2% of the total recurrent expenditure in health, behind hospital services (39.3%), medical services (18.7%), and medications (14.0%). Obesity and dental caries share common, modifiable, influences such as diet and lifestyle. Recent national data from Sweden suggest a positive correlation between dental caries and Body Mass Index (BMI), and showed that obesogenic behaviour such as snacking in early childhood predicted caries development in adolescence. BMI is widely used as a surrogate measure for obesity because it corrects for an individual’s height in relation to weight, and is a commonly used indicator of can indicate nutritional status. Given that dental caries rates and BMI both measure diet-related health outcomes, an association between the two is not surprising. Changes to diet and lifestyle since the mid 1990s, such as increased affluence and access to high caloric carbohydrate-rich foods and drinks, may help to account for the rising prevalence in dental caries and obesity since that time[6, 7]. However, not all studies have found a positive association between BMI and dental caries; some studies suggest that there is no relationship (for example,) and others show an inverse relationship (for example,). To our knowledge there has been only one systematic review examining the relationship between obesity and dental caries. This review included only seven studies published between 1984 and 2004, only five of which included a pediatric sample. Of the three A grade studies, one found a positive correlation between dental caries and BMI in a sample of 842 children aged 6 to 11 years. Another found no correlation in a sample of over five thousand 3-year olds, while the third was not able to predict future dental caries experience on the basis of BMI status in more than five hundred children (aged 5 to 13 years). What do studies reveal about the association between dental caries and BMI in children and adolescents? What are the methodological limitations of the current approaches to investigating the development of both dental caries and obesity and what may be valuable directions for future research? Measured caries rates, most commonly by variations of the number of decayed (Dd), missing (Mm), filled (Ff) surfaces (Ss) or teeth (Tt) index or presence/absence of caries (that is, DMFT/dmft >0). However studies that categorized teeth conditions (for example, levels of caries experience: frank caries, filled teeth, white spots and no caries ) or described dental health (for example, cavity now or ever, filling, tooth pulled, and overall dental health ) were also included in the review. Measured some form of weight-to-height ratio to estimate body fat. This was most commonly estimated using BMI, but body fat index (DXA ) and Division of Nutrition, Thai Ministry of Public Health standards using weight for height in Thai children  were also used. Assessed the relationship between dental caries and BMI in children and adolescents to age 18 years. Studies were evaluated on the basis of a number of criteria to assess quality of methodology. These criteria are summarized in Table 1 and Additional file1. The first criterion was representativeness of sample, and studies were ranked 1 (highest) to 4 (lowest) as follows: 1) sample involved forms of stratification or cluster sampling of countries or districts that ensured a representative range of socioeconomic strata; 2) sample represented cities or towns using some form of cluster sampling (for example, of schools); 3) sample of convenience with some randomization involved in selection of participants; and 4) sample of convenience without random selection (for example, patients of obesity clinics, dental hospitals). The second criterion was whether or not an attempt had been made to control potential confounding variables; studies were scored on a yes/no basis (Yes = 1; No = 2). The third criterion assessed the quality of assessment of the child weight-to-height (for example, BMI) and dental caries. Measures of child weight-to-height were scored for objective measurement using standardized equipment (score 1) or other (score 2). Scores for the quality and sensitivity of the dental examination ranged from 1 (highest) to 5 (lowest; see Table 1). Rating 1 examinations were conducted within a dental surgery with mirror and probe by a qualified dentist, dental student, or hygienist and included radiographs. Rating 2 involved dental examinations within a dental surgery with mirror and probe by a qualified dentist, dental student, or therapist/hygienist but did not include radiographs. Examinations Rated 1 or 2 were performed under optimal lighting conditions with dry field available, which improves detection rates and enabled the detection of initial caries lesions. Rating 3 involved examinations that were performed under field conditions, which typically rated caries at the cavity level. Most examinations at this level were carried out with natural lighting, blunt probe and mirror (that is, following WHO criteria), and may have been undertaken by someone other than a qualified dental professional. Rating 4 involved visual examination involving mirror only, and Rating 5 involved parent or self report. Under field conditions obtaining a dry field is difficult although some studies used cotton rolls/pellets; a lowercase superscripted ‘a’ with the rating scores of 3 or 4 denotes these studies. Calibration exercises were undertaken in all studies involving dental examinations. Attempt made to control confounds? The potential range of scores following assessment of methodological quality ranged from 4 to 13. Studies scoring 4 to 5 were rated A, 6 to 7 rated B, 8 to 10 rated C and 11 to 13 rated D.
The flow diagram of the processing of search results is shown in Figure1. Forty-seven papers met the selection criteria and were included in the review. However, two papers[5, 18] reported the same data and were combined for the purpose of this review, while two other papers[19, 20] reported findings of two septe studies. A total of 48 studies were therefore included, (excluded papers and reasons for exclusion are presented in Additional file2). Only two studies were also cited in Kantovitz et al. review[8, 11]. The flow diagram of processing of search result. Three main patterns of relationships were found between dental caries and BMI: 23 of the 48 studies found no association between BMI and dental caries, 17 found a positive relationship between BMI and dental caries, and nine found an inverse relationship. One additional study found dental caries was associated with both high- and low- BMI; that is, a U-shaped pattern, and another found inconsistent patterns across age cohorts; specifically, an association between lower dental caries and high BMI in two age cohorts, and no association in four cohorts. In order to explore possible explanations for these differences in patterns, the results of the 48 studies were septed and evaluated on the basis of the nature of the relationship between caries and BMI. That is, positive, negative and no association are summarized in Tables 2,3 and4 respectively. The study finding that dental caries is associated with both high and low BMI is included in both Tables 2 and3 and the study finding no association and a negative association between dental caries and BMI depending on the age cohorts is included in Tables 3 and4. Table 5 summarizes the patterns that emerged within each set of studies. Higher approximal dental caries in overweight and obese adolescents than normal and underweight. Significant association between high dental caries and increased obesity. Higher caries (dmft:1–6) associated with higher weight-for-age. For d1-6mfs: higher consumption of soda drinks, older child age, higher weight-for-age, visiting a dentist for treatment, higher baseline caries level of the child and caregiver, fatalistic belief of the caregiver, and living in relatively disadvantaged low-income neighbourhood. Higher rates of dental caries (DMFS) in overweight and obese children than normal weight children. Underweight children had significantly higher DMFS rates (but not dfs) than normal weight, overweight and obese children. Gender (slightly higher cavities prevalence in boys, particularly in the DF-T-index and if overweight. Higher DMFT+dmft rates in underweight than normal weight. Higher PUFA+pufa index in underweight than normal weight. Higher caries (def) associated with lower BMI in less affluent group but not in affluent group. Thai Ministry of Public Health manual used to classify children as underweight, normal, overweight and obese. Mothers’ and fathers’ education level, household overcrowding, and number of children associated with dental caries prevalence. Higher rates of dental caries (DMFS) in overweight and obese children than normal weight children. Underweight children had significantly higher DMFS rates (but not dfs) than normal weight, overweight and obese children. Matched suburbs. Participating schools in Turkey selected through cluster sampling to represent socio-economic range of district. No direct association found between BMI and DMFT Turkish children from public school had lower mean BMI but higher Mn DMFT than Turkish children in private school Turkish sample higher in BMI and dental caries than Finnish sample. FA found obesity and caries shared same cluster. No association between caries and BMI Significantly higher decayed in public school. No association between caries and BMICaries associated with having visited a clinician. Convenience sample from Iztapalapa´s area of Mexico City. No association between DMFT caries and weight category. No association between dmfs and BMI Higher rates of caries associated with reduced height suggesting caries is impacting on normal growth and development. 1Authors found a negative association using a logistic and Poisson regression models but report no association after undertaking a zero-inflated and zero-inflated negative binomial regression models. HDI* = Human Development Index. Given that a number of studies used samples of convenience and special populations, (for example, hospital lists for dental extractions under general anesthetic and lists for obesity programs), the distribution of dental and BMI scores varies between studies. The results of these studies are of interest, but it is important to be mindful that these studies will have not tested the association between dental caries and BMI across the full range of potential scores. For this reason, sample statistics for caries and BMI measures (where provided in the studies) are included in summary tables for consideration when comparing results. The summary tables also provide information about each study’s setting, design, sample, dental measures, human development index (HDI), and factors associated significantly with dental caries in childhood and adolescence to facilitate interpretation of findings across studies. After assessing for bias, only five studies met the criteria for A rating[19, 24–26], and 20 studies met the criteria for a B rating (see Additional file1). The findings of the five A-rated studies were mixed: two found that dental caries was higher in children with higher BMI[24, 25]; one found a negative association in children aged 6 to 11 and 12 to 18 years but no association in children aged 2 to 5 years; and two found no association in children aged 2 to 17 years[19, 26]. Four of the five studies used data collected as part of the National Health and Nutrition Examination Survey (NHANES) database, a large nationally representative sample in the United States[19, 25, 26], and three studies used the same 1999 to 2002 cohort[19, 25, 26]. Hong et al., Macek and Mitola, and Kopycka-Kedzierawski et al. analyzed the data collected from children aged 2 to 5 years in the 1999 to 2002 cohort and reported different results: positive, no association, and no association, respectively. The sample sizes between these three studies differed slightly (1,506; 1,449; 1,719; respectively); Hong et al. excluded children with fewer than 10 teeth, which might explain the smaller sample, but no exclusion criteria are provided for the other studies. All studies found similar trends for children at risk/overweight to have higher risk of dental caries than normal-weight children. Hong et al. stratified by age and found the difference to be significant in children aged 60 to 72 months whereas Macek and Mitola and Kopycka-Kedzierawski et al. collapsed across age and found no association. Kopycka-Kedzierawski et al. investigated other age groups within the 1999 to 2002 cohort and found no association in children aged 6 to 18 years. The fourth study that used the NHANES III cohort found that children aged 6 to 18 years who were overweight had a reduced risk of dental caries in both permanent and deciduous teeth compared to children of normal weight. No association was found in children aged 2 to 5 years. The fifth study was a large cohort study from Sweden. A prospective association between obesity at an early age (4, 5, 7, and 10 years) and dental caries at age 12 years was reported. Thus, across these five A-ranked studies, four found trends consistent with a positive association between dental caries and BMI, which were significant in only two studies. The fifth found a negative association. One important problem with all five A-ranked studies is the restricted BMI range in the samples; underweight children were significantly under-represented. Only one study reported the proportion of underweight children in their sample (4.2%;), and no studies included underweight as a BMI category. This is problematic for two reasons. First, the association between BMI and dental caries was inadequately tested because the association was not tested across the full range of BMI scores, and second, it must be concluded that any underweight children were absorbed within the ‘normal-weight’ category for comparison with children at-risk and overweight because no information was provided about their exclusion. If underweight children have systematically higher rates of caries than normal-weight children, and there is evidence that this may be the case (for example,), caries incidence and severity in the normal-weight group would be inflated by the inclusion of underweight children, and potential differences between normal-weight and overweight-groups attenuated. The non-significant trends found in the NHANES studies[19, 25, 26] might be explained in this manner. Underweight children should be excluded from the analysis if insufficient in number to instantiate a comparison group, and it would be helpful if this information was provided. Table 2 contains a summary of the 17 studies that found that dental caries prevalence or severity is higher in children and adolescents with higher BMI/body fat index. Caries prevalence ranged from 17.9% to 90% but the population-based studies reported prevalence rates between 42% and 67%. The dmft/DMFT rates were positively skewed, ranging from 1.4 to 6.9 with most studies reporting dmft/DMFT of approximately 2.0. The BMI distributions in this group appeared to be negatively skewed with seven studies[11, 16, 21, 25, 28–30] reporting that approximately 2 to 10% of their samples were underweight and 20 to 30% of their samples were overweight or obese. Six studies[23, 24, 27, 31–33] appeared to have no underweight children in their samples, and remaining studies failed to provide sufficient detail[14, 34, 35]. The samples in these studies therefore appeared to be positively skewed for dental caries and negatively skewed for BMI. Overall, the findings from this group of studies suggest that dental caries, as measured by prevalence or severity in deciduous and permanent teeth, increases with increased BMI. There is some suggestion that this association is moderated by age; three studies[25, 28, 31] found the association between high BMI and high dental caries appeared at around the age of 5 to 9 years and not earlier, although two [14, 25,] found the association in children under age 5 years. Other factors found to influence caries prevalence and severity rates include consuming ‘caries risk products’ more than three times per day at age 1 year; sweets more than once per week at age 3 years; higher rates of soda pop consumption[29, 34]; sugar consumption; lower socioeconomic status/poverty index/living in a disadvantaged neighborhood[24, 25, 29, 34]; ethnicity, specifically being Hispanic or non-Hispanic black; dental fatalism in caregivers; parents’ poor attitudes to dental health and psychosocial factors; less educated parent; and heavier mothers. Table 3 summarizes the nine studies that found a negative association between dental caries and BMI. Caries prevalence ranged from 23.4% to approximately 80%,. The dmft/DMFT rates ranged from 2.07 to 14.0. Two studies reported odontogenic infections in more than half of the samples[37, 38]. Three of the nine studies in Table 3 described the distribution of both underweight and overweight children in their sample[9, 17, 21]. Other factors associated with dental caries were social deprivation/affluence/lower socioeconomic level/lower household education level[9, 19, 39, 40], all of which have also been associated with obesity, and larger families[36, 37]. Table 4 summarises the 23 studies that found no association between dental caries and BMI. Caries prevalence ranged from 19.1% to 91% with higher prevalence in public schools (60.8%, 26.4%, 52.4%) compared to private schools (11.9%, 11.4%, 9.6%). Mean dmft/DMFT varied from .23 in private school children in Brazil to 14 in children from remote areas of the rain forest of Suriname, with most studies reporting approximately 2.0. Seven of the 22 studies provided a breakdown of BMI categories, and the distributions included both a negative[26, 47–49] and a positive skew[43, 50, 51]. Unfortunately, many studies described only the proportion of obese and non-obese participants. Failure to distinguish between normal-weight and underweight children makes it difficult to know how well the association between caries and BMI was tested in underweight children or between normal-weight and overweight chidlren. Proportions of obese children reported in these studies ranged from 20 to 50%[8, 15, 20, 25, 44, 48, 52]. Factors that were found to be associated with caries were ethnicity[8, 47], low parental education achievement[8, 19], poverty/lower socioeconomic level (below the federal poverty level[8, 19, 43]), higher SES level, female gender[48, 53] not eating breakfast daily, eating fewer than five servings of fruit and vegetables daily, attending public school[20, 42, 44, 50], school absenteeism, soft drink consumption[50, 54], low health attitude, and reduced height. Table 5 summarizes emergent patterns that may help account for the dispte findings between the three sets of studies. These patterns primarily relate to differences in the method of dental examination and sample demographics. These differences are noted below. Method of dental examination: Studies that found a positive association between BMI and dental caries primarily used dental examinations that permitted the detection of initial caries (that is, ranked 1 or 2) whereas studies finding a negative, or no association, tended to use field examination methods (that is, ranked 3 or below), which underestimated caries rates (see Tables 2, 3 and 4 for detail and Table 5 for summary). A chi-square test of independence revealed this association approached significance (χ 2 (2) = 5.19; P = .07). Sample differences: Studies that found a positive association between BMI and dental caries were primarily conducted in Europe and the United States (see Table 2); those that found an inverse association were primarily conducted in Asia and South America (see Table 3); and those that found no association were largely conducted in the United States, South America and Europe. In an effort to quantify and compare the level of development of the countries represented in the three sets of studies, the Human Development Index (HDI) ranking for each sample is provided in Tables 2, 3 and 4. The HDI is a composite human development index that combines life expectancy, educational attainment and income to rank and compare the level of development of different countries . A Kruskal-Wallis test revealed a significant difference in HDI between the three sets of studies (χ 2 (2) = 7.067, P <.05) Those studies finding a positive association between dental caries and BMI used samples from more highly developed countries than studies that found an inverse association (U = 27.00, P <.01). Prevalence: Dental caries prevalence tended to be similar across the three sets of studies although it should be recognized that studies summarized in Tables 3 and 4 tended to exclude non-cavitated lesions and therefore underestimate caries prevalence. Caries severity, as measured by dmft/DMFT tended to be higher in studies finding an inverse association between BMI and dental caries than studies finding a positive or no association. A Kruskal-Wallis analysis found a significant difference (χ 2 (2) = 7.255, P <.05). Post hoc tests, using Mann Whitney U, suggests studies that found an inverse association between dental caries and BMI had involved samples with a significantly higher dmft/DMFT rate than studies finding no association (U = 67, P = 0.46) or a positive association (U = 73.50, P = 0.03). BMI distribution: The nature of the distribution of BMI differed across the three sets of studies, which is problematic. In order to determine whether BMI is adequately tested against dental caries it is important to ensure that the sample represents the full range of BMI categories (that is, low (underweight), normal, and high (overweight/obese)). Only 68% of the studies reported the proportion of their sample that was overweight or obese, and 48% reported the proportion that was underweight. A Kruskal-Wallis test found underweight participants were significantly under-represented in studies that found a positive association between BMI and dental caries (χ 2 (2) = 6.877, P <.05) compared with studies finding an inverse associations (U=8, P <.05), and no association (U=23, P = .046). No differences were found between studies in the proportion of the sample that was overweight or obese although only half of studies that found negative association reported the proportion of the sample that was overweight or obese. A related issue is the inappropriate collapsing of groups across BMI categories as mentioned earlier. Studies that collapse across BMI categories assume a linear relationship exists between dental caries and BMI. If the relationship is non-linear, collapsing across BMI groups can attenuate any between-group differences between overweight or underweight children and the normal-weight reference group. Similarly, analyses that assume a linear relationship between BMI and dental caries, such as bivariate correlations may not detect a non-linear relationship. Given the evidence that dental caries is associated with both high and low BMI, analyses appropriate for non-linear associations might be more appropriate. Only four of the 23 studies that found no association between dental caries and BMI compared dental caries across low-weight, normal-weight, and over-weight groups[26, 48–50]. Of the remaining 20 studies, five studies used analyses that assumed a linear relationship[43, 46, 47, 52, 55], and 11 studies compared overweight or obese children with ‘non-obese’ or ‘normal-weight’ children[8, 15, 19, 22, 43–45, 51, 54, 56] without providing information about how they accounted for underweight children in their sample. Three studies excluded underweight children to permit a comparison between obese and normal-weight children[20, 42, 57]. 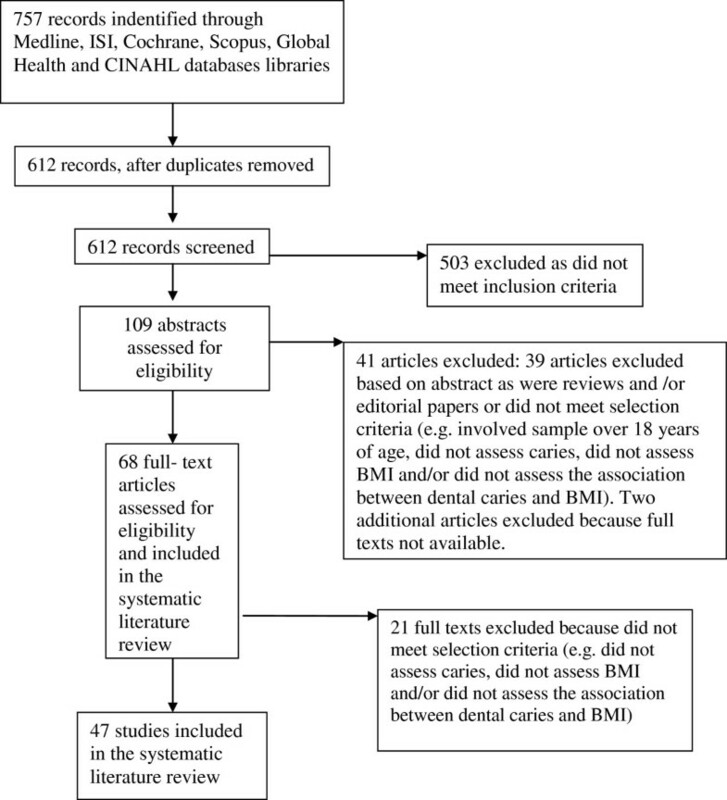 The results of this systematic review show that there is still significant disagreement as to the existence and nature of an association between dental caries and BMI. Forty-eight percent of studies reviewed found no association between dental caries and BMI; 35% found a positive association and 19% found an inverse association. Our results are therefore consistent with those of Kantovitz et al. ; however, we would like to speculate further about the association between dental caries and BMI, offer possible reasons for the disparity in findings, and make recommendations for modifications to future research in this area. We suggest that dental caries and BMI are related in a nonlinear fashion with more dental caries occurring in individuals with either higher or lower BMI. Furthermore we suggest that methodological factors including sample demographics, the sensitivity of the dental examination, and the nature of the data analyses undertaken influence whether or not the association is detected. The evidence supporting an inverse relationship between dental caries and BMI comes from studies in developing countries and/or from samples with severe dental caries. Severe dental caries may well reduce eating ability thereby resulting in poor weight gain. Evidence to support this can be seen when, post-comprehensive dental rehabilitation, young children with early childhood caries show significantly increased growth velocities compared with controls. Malnutrition could also predispose to dental caries; deficiencies in protein or energy foods may lead to protein-energy malnutrition, decreased salivary flow, calculus formation, high levels of caries and reduced growth. Chronic malnutrition, particularly during the early years, has been shown to increase susceptibility to dental caries in the primary dentition (for example,) perhaps via enamel hypoplasia and salivary hypofunction. Alternatively both outcomes could be influenced by a third variable (or cluster of variables) such as those associated with SES. Socioeconomic factors clearly impact the development of caries and need to be understood. Lower socioeconomic status (SES), whether measured by living in a disadvantaged neighborhood, below the poverty line, attending public versus private school (for example[24, 25, 29]), is associated with higher caries indices. A cluster of factors such as low parental education level, ethnicity, limited access to services and support, associated with low SES, are also associated with higher caries rates (for example,[25, 29, 34]). However dental caries is not limited to those from low SES backgrounds; children from high SES groups, whose parents have high expendable income, can have increased exposure to fermentable carbohydrates and may be at an increased risk of dental caries (for example,[50, 61]). Obesity is also experienced in children from higher SES backgrounds[2, 7]. The studies that support a positive association between BMI and dental caries include those in which 1) samples were negatively skewed for BMI with underweight children underrepresented; 2) samples were from highly developed countries with high standards of living and improved access to public health (presumably including fluoride); and 3) studies that tended to use more sensitive dental examinations that permitted the detection of initial caries. It is possible that the development of dental caries in more affluent populations follows a different pathway to that in less-affluent populations. Dental caries is likely to be slower progressing (for example due to increased fluoride exposure or reduced likelihood of chronic malnutrition) and it may therefore be critical to include initial caries in caries diagnosis in more affluent populations in order to detect subtle differences in dental health. It is not surprising to find that children who are overweight or obese also have relatively high levels of dental caries given that overweight children tend to consume high levels of soda and other energy-dense foods, many of which are cariogenic and obesogenic. Modeer et al. suggest that obese children are at risk of dental caries because they have reduced salivary flow, something also found in underweight children, and which is associated with protein-deficient malnutrition. Obese children may well suffer from protein deficient malnutrition if their energy intake is made up of high carbohydrate, highly processed foods. Almost half of the studies included in this review found no association between dental caries and BMI. We have suggested that several methodological factors may have contributed to these findings including: 1) a failure to include initial caries in caries assessment, which is important given the possibility that the ratio of initial to manifest caries may be different in overweight and underweight samples; 2) a failure to appropriately sample from the full range of BMI scores to adequately represent underweight, normal, and overweight and obese participants; 3) the undertaking of analyses that assume a linear relationship; and 4) the collapsing across BMI categories when making between-group comparisons (for example). Costacurta et al. suggest that BMI may not be the best measure of body fat composition when testing the association between dental caries and obesity. They suggest that misclassification of childhood obesity using BMI might account for the failure of studies to detect the association between child adiposity and dental caries (in samples where children are normal-weight and overweight). When screening for dental caries, initial caries should be included in the caries measure, and the same diagnostic criteria should be used by all researchers to enable comparisons to be made across studies. Despite attempts to standardize caries assessment for research purposes since 2002 (for example, ICDAS, 2009 ) considerable disparity in diagnostic criteria still exists. To permit some level of comparison to be made across studies, it would be useful to have access to details about sample pmeters for target variables such as BMI and caries pmeters, prevalence rates, a breakdown of BMI groups and demographic information such as SES. The possibility of a non-linear association between dental caries and BMI should be considered, and appropriate analyses performed when testing the relationship. Prospective longitudinal studies are needed to explore the causal relationships between the variables alluded to in this systematic review and to inform interventions. Longitudinal studies are also required to study the long-term association between dental health indices and broader general health outcomes because dental indices may provide a more reliable indicator of future health outcomes than BMI. BMI fluctuates throughout life and may not, at any given point in time, provide an accurate representation of a lifetime of dietary and health behaviors. Also, it is important to establish first, the time required for the association between obesity and caries to manifest, and second, to determine whether the association changes over time. Given the impact of parent factors such as socioeconomic status, education level, diet, dental fatalism, health attitudes and so on, on the development of dental caries as found across studies, a focus on familial or parental influences is warranted. Such an approach might help explicate the effect of wider ecological influences, such as SES on the development of dental caries, especially in early childhood when dietary habits are being formed and implemented by parents. There is evidence that dental caries is associated with both high and low BMI. Although the precise nature of these associations remains unclear, it is possible that different factors are involved in the development of caries in children with high and low BMI and in high and low socio-economic strata. Evidence supports the proposal of combined strategies to target both dental caries and obesity simultaneously, however further investigation of the association between the diseases and among their predictors is required. Specific attention should be given to longitudinal studies to gauge the association between early childhood caries and health outcomes in adolescence and adulthood, to the inclusion of younger children (aged 0 to 6 years) in the samples, to the perseverance of dietary and health-related behaviors developed during the preschool years, and to parental or familial influences on the development of these patterns. Abbreviations: BMI, body mass index; DMFT/dmft, decayed (D/d ), missing (M/m), filled (F/f) surfaces (S/s) or teeth (T/t) index in the permanent/primary dentition; HDI, human development index; NHANES, National Health and Nutrition Examination Survey; SES, socioeconomic status. The authors would like to acknowledge the valuable feedback received on early drafts of this manuscript by Francisco Vázquez-Nava, PhD, and Julie Eichenberger Gilmore, PhD. CB carried out the initial database searches and preliminary readings. MH re-read abstracts and articles for final selection and prepared the draft. All authors read and approved the final manuscript.